The Cabot Head Stewardship Program is a unique opportunity for those interested in experiencing the Bruce Peninsula first hand, while at the same time helping nature. 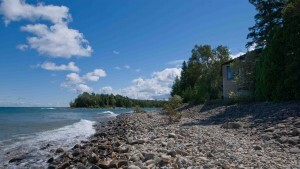 The program offers two waterfront rustic cabins, Wingfield Cottage or Grebe Lodge, situated at the Research Station in Cabot Head Provincial Nature Reserve on the coast of Georgian Bay. There are a minimal number of volunteer duties, which include light maintenance, recording observations, and providing information to boaters and others who come onto the property. The Stewardship program was developed as a way to both increase revenue to support the migration monitoring program, as well as to maintain a presence at the site when monitoring is not in operation. The steward’s primary responsibility is to occupy one or both of the cottages. In so doing, the stewards maintain a presence at the site so it does not look vacant, undertake basic maintenance (simple cleaning chores). Water is drinkable and is tested regularly. Because the cottage is on a septic system, water should be used sparingly and showers should be kept short. No ‘disposables’ should be flushed down the toilet. You can swim either in Wingfield basin or in the Georgian Bay. Kayaking is excellent, but be mindful of the weather and wind conditions. Firewood is available on-site and is an additional charge. Please enquire when signing in. All garbage is to be taken from the site during departure. During your stay garbage/recyclables are to be left indoors to prevent attracting unwanted visitors. There are 3 available local waste facilities that are open during various times to accommodate your needs. Refer to waste site schedule posted on the cottage communication boards for details. We do not compost on-site as it attracts bears. What to bring: Bedding, enough food for your stay. (the nearest small store is 15km and larger shops are in Lion’s Head and Tobermory 35km.) Sunscreen, insect repellant, toilet rolls. Personal items. Binoculars. Natural Hazards: Poison ivy is quite prevalent in the area. Massasaugas, a threatened rattlesnake species, and Black Bears are occasionally found on the property. Black flies and mosquitoes can be a nuisance outdoors at certain times. Stewards coming to the site will find it operating on its own solar panels and propane appliances. Stewards are reminded that personal energy conservation measures, such as reduced water and electrical consumption, are the environmental responsibility of everyone using the facility. Grebe Lodge sits right on the Georgian Bay shore, affording great views! Cabot Head Research Station, Cabot Head Provincial Nature Reserve. The Research Station is literally at the end of the road, situated in a UNESCO World Biosphere Reserve and Dark Sky Community. It is a pristine location with wonderful opportunities for exploration, birding, botanizing, and just relaxing. Map. A list of light duties can be provided to each steward. They may include: carrying out minor maintenance (cleaning windows, cutting grass, etc); recording observations; providing management messages to boaters and others using the property. Other duties may also be identified, as needed. We are looking for people who will love the unique qualities the Bruce Peninsula and Wingfield Basin have to offer, and who are willing to spend some time performing light volunteer duties at the station.